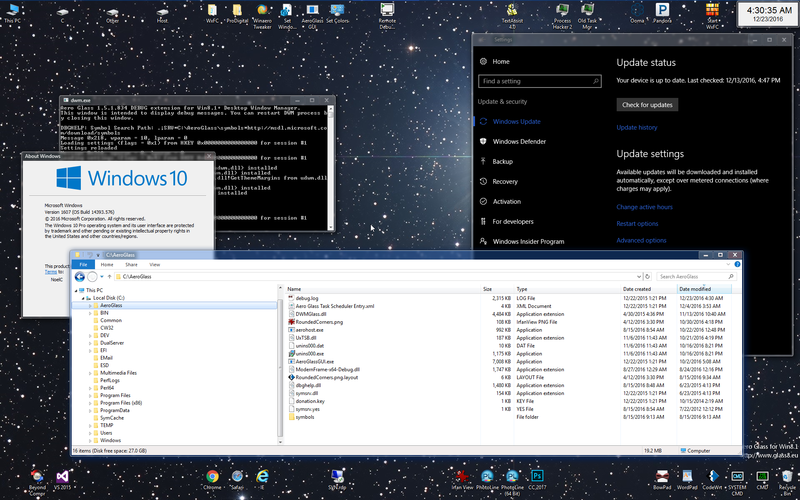 It seems that Aero Glass for Win8.1+ 1.5.1.724 don't work with my last version of windows 10 : 1607 build(14393.479). It woorked on the last versions. Could someone tell me what to do ? It's working okay for me... Since it's not a basic compatibility problem can you please describe what's going wrong for you? Yes, and a desktop watermark but I expect to see them since I'm now running Debug versions (testing the latest Debug build that avoids using AppInit_DLLs and works via regsvr32 to get hooks in for ModernFrame and UxTSB). Beyond what's shown above (note 1.5.1.834) I also get a debug window for ApplicationFrameHost. I just minimize them. But I'm not having problems. Maybe something's fixed in 1.5.1.834 that is not fixed in 1.5.1.724?